AMERICANS watching John F. Kennedy's 1961 inauguration on television saw a scene worthy of Currier & Ives. The marble facade of the Capitol gleamed in the sun, dignitaries wore top hats and dark overcoats and the cold air turned Kennedy's breath into white clouds. When he said, "Let the word go forth from this time and place, to friend and foe alike, that the torch has been passed to a new generation," his words actually appeared to be going forth into the exhilarating air. Praise for his inaugural address came from across the political spectrum - Barry Goldwater said, "God, I'd like to be able to do what that boy did there" - and was so extravagant it seems hard to believe the nation was even more divided than it is today. Kennedy had won the 1960 election with only 49.7 percent of the popular vote, yet a Gallup poll taken soon after his inauguration showed him with an approval rating of 72 percent. His own pollster, Lou Harris, put it at an astounding 92 percent. Richard Nixon, Ronald Reagan and Bill Clinton, perhaps hoping for similar ratings, have paraphrased lines from Kennedy's speech in their own inaugural addresses. The most recent offender was George W. Bush, who in 2001 translated "Ask not what your country can do for you - ask what you can do for your country" into "What you do is as important as anything government does. I ask you to seek a common good beyond your comfort; to defend needed reforms against easy attacks; to serve your nation, beginning with your neighbor." Kennedy's imitators have failed to appreciate that the words in his address were only part of its magic. There was also the brilliant weather, Jackie Kennedy's wardrobe, Robert Frost's poem and a president-elect who had devoted almost as much attention to his appearance as his words - darkening his tan in Palm Beach, and fussing over the cut of his suit and the arrangement of dignitaries on the platform. They have failed to appreciate something else, something that is nearly impossible to replicate. It was Kennedy's life - and his close calls with death - that gave the speech its power and urgency. Those who study the speech would do well to pay less attention to the words and more attention to how he wrote the speech and to the relationship between its words and Kennedy's character and experience. Kennedy composed the most memorable and poetic lines of his inaugural during a flight from Washington to Palm Beach 10 days before his inauguration. He summoned his secretary Evelyn Lincoln into his private compartment on his plane, the Caroline, and told her that he wanted to dictate some "ideas" for his inaugural. He had in hand a draft written by his principal speechwriter, Ted Sorensen. Throughout his campaign, Kennedy had often carried a Sorensen speech to the stage only to abandon much of it in favor of his own off-the-cuff remarks. He did this again during the Palm Beach flight, and dictated several pages of his own material. It is in Evelyn Lincoln's shorthand loops and squiggles, then, that one first reads versions of "Let every nation know, whether it wishes us well or ill, that we shall pay any price, bear any burden, meet any hardship," and "Let the word go forth from this time and place, to friend and foe alike, that the torch has been passed to a new generation of Americans - born in this century, tempered by war, disciplined by a hard and bitter peace, proud of our ancient heritage." Kennedy revised his inaugural in Palm Beach, without the assistance of the focus groups or speechwriting teams that have become de rigueur. He read it aloud to his wife, rewrote some passages on sheets of yellow legal paper and consulted with Ted Sorensen. He did not need much help revising his dictation because it was essentially autobiographical. It told his story, and that of his generation: "born in this century," "tempered by war," "disciplined by a hard and bitter peace." Behind this structure lay five pivotal moments in his life: his travels through Europe on the eve of World War II, his experiences in the Pacific in 1943, his visit to a devastated postwar Berlin in 1945, his tour through Asia as a young congressman in 1951, and his encounter with the abject poor during the 1960 West Virginia primary. All but one of these had occurred overseas, a reminder that he was not only the most widely traveled man ever to become president, but someone who had experienced many of the defining moments of his life outside his own country. Kennedy had a strong emotional connection with the passages inspired by his own experiences. Throughout his political career he had sometimes choked up at Memorial Day and Veterans Day ceremonies when speaking about those who had lost their lives in World War II. Among the passages he had dictated on the flight was this one: "Since this country was founded, each generation of Americans has been summoned to give testimony to its national loyalty. The graves of young Americans who answered the call to service surround the globe." Numbered among these young Americans, of course, were his brother Joseph Kennedy Jr., his brother-in-law Billy Hartington, and his PT-109 crewmen Andrew Kirksey and Harold Marney. These two sentences, a tribute to their sacrifices, would prove to be the emotional turning point of his inaugural, the moment when his voice assumed a passion he seldom revealed, inspiring the audience at the Capitol, touching even the hearts of his opponents, and, according to accounts from the time, sending half-frozen tears rolling down cheeks. It is possible that a future president will evoke a similar reaction with an inaugural address, uniting Americans in a common purpose, and opening a new era of idealism, optimism and national happiness. 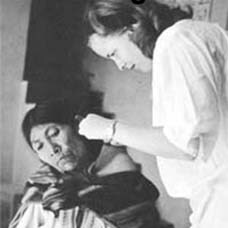 But to accomplish this, he must do more than others have done: simply paraphrase or echo Kennedy. Instead, he will have to deliver an inaugural that so clearly engages his emotions, and so convincingly represents a distillation of the spiritual and philosophical principles guiding his life, that it will, in the end, awaken a deep emotional response from the American people, too. 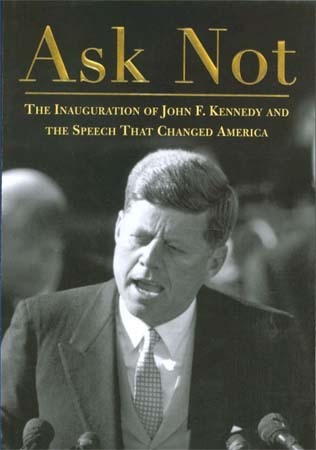 Thurston Clarke is the author, most recently, of " Ask Not: The Inauguration of John F. Kennedy and the Speech That Changed America."